This is a short introduction of People's Solidarity for Participatory Democracy for English users, as of June 2017. 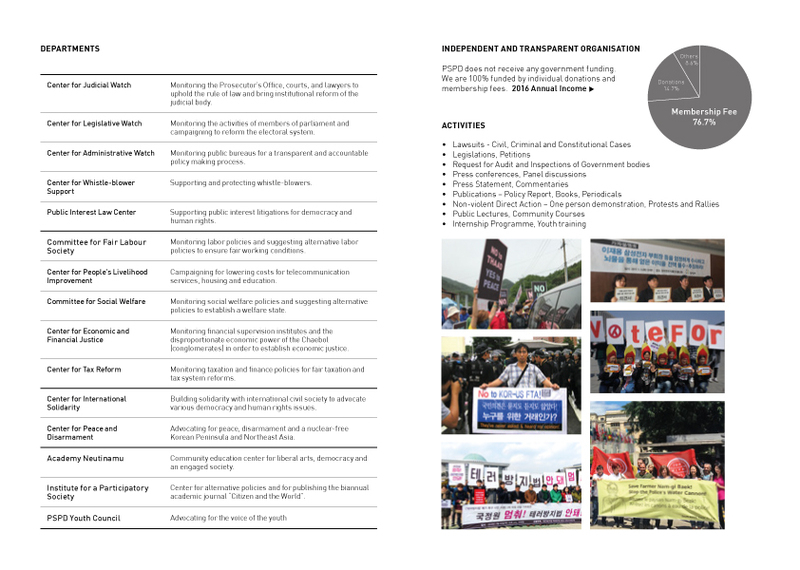 People’s Solidarity for Participatory Democracy (PSPD) is a non-governmental organization based in Seoul, South Korea. We were founded in 1994 by activists, scholars and lawyers who were engaged in various democratic movements for participatory democracy and human rights. PSPD has been working on promoting people’s participation in government decision making processes and socio-economic reforms, by closely monitoring the abuse of power of the state and corporations to enhance transparency and accountability. We are a watchdog organization that closely monitors abuse of power by government and private coorporations. We research and propose alternative policies, bills and measures to enhance the livelihood and the rights of people. Members and volunteers are fundamental to our activities. Our operations depend on membership fees of around 15,000 members (as of January 2016). We stand in solidarity with local, glocal, and global people’s movements to uphold democracy. We promote and protect human rights of minorities and marginalized people. 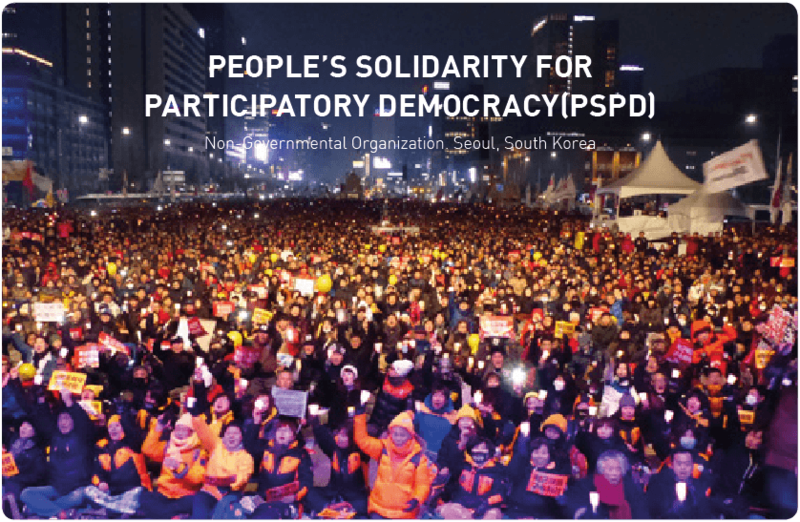 People’s Solidarity for Participatory Democracy (PSPD) is a non-governmental organization based in Seoul, South Korea, founded in 1994. PSPD has been working on protecting people's participation in government decision making processes and socio-economic reforms, by closely monitoring the abuse of power of the state and corporations to enhance transparency and accountability. Center for Judicial Watch Monitoring the Prosecutor’s Office, courts, and lawyers to uphold the rule of law and bring institutional reform of the judicial body. Center for Legislative Watch Monitoring the activities of members of parliament and campaigning to reform the electoral system. Center for Administrative Watch Monitoring public bureaus for a transparent and accountable policy making process. Center for Whistle-blower Support Supporting and protecting whistle-blowers. Committee for Fair Labor Society Monitoring labor policies and suggesting alternative labor policies to ensure fair working conditions. Center for People’s Livelihood Improvement Campaigning for lowering costs for telecommunication services, housing and education. Committee for Social Welfare Monitoring social welfare policies and suggesting alternative policies to establish a welfare state. Center for Economic and Financial Justice Monitoring financial supervision institutes and the disproportionate economic power of the Chaebol (conglomerates) in order to establish economic justice. Center for Tax Reform Monitoring taxation and finance policies for fair taxation and tax system reforms. Center for International Solidarity Building solidarity with international civil society to advocate various democracy and human rights issues. 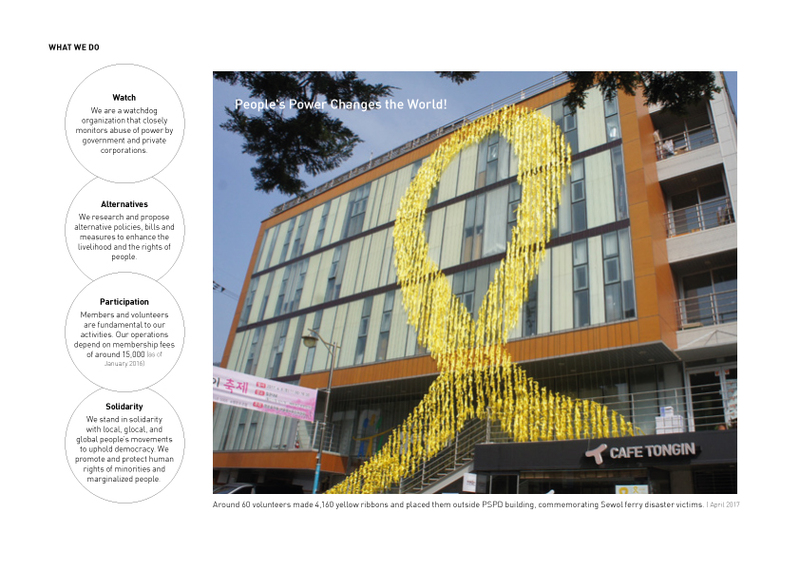 Center for Peace and Disarmament Advocating for peace, disarmament and a nuclear-free Korean Peninsula and Northeast Asia. Academy Neutinamu Community education center for liberal arts, democracy and an engaged society. Institute for a Participatory Society Center for alternative policies and for publishing the biannual academic journal “Citizen and the World”. PSPD does not receive any government funding. We are 100% funded by individual donations and membership fees. To be an independent and transparent watchdog organization, our mandate requires all works of PSPD to be politically impartial. Our main source of income is individual membership fee. We do not receive any government grants. Being financially independent is our priority. PSPD has been actively engaging with UN bodies including the UN Human Rights Council and the Security Council. 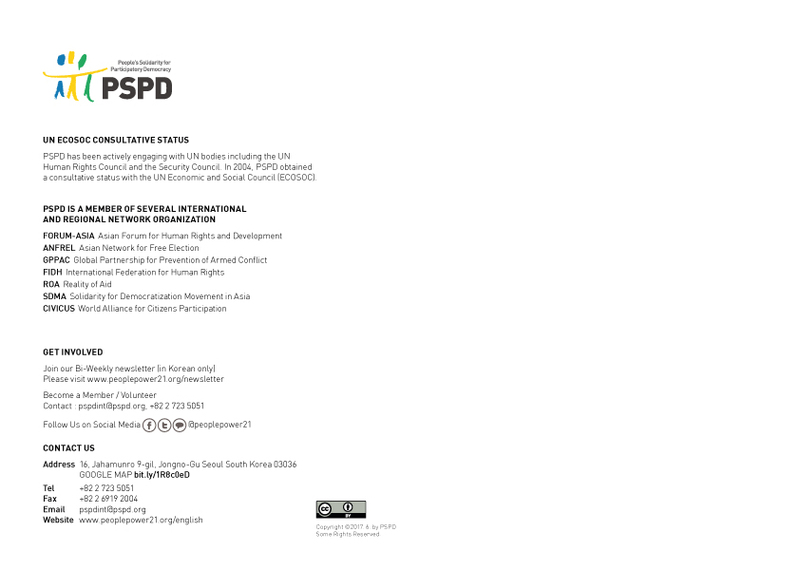 In 2004, PSPD obtained a consultative status with the UN Economic and Social Council (ECOSOC).